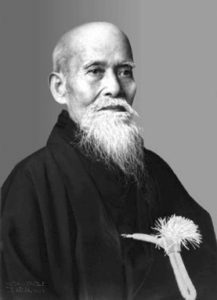 Aikido is the creation of Morihei Ueshiba, commonly known as O’Sensei (great teacher). Although he was a reknown martial artist, having studied and mastered many martial arts (Jujutsu, Judo, swordsmanship), he came to the realization that fighting for its own sake was futile and created Aikido as an answer to the need for peaceful conflict in the post-World War II era. Unlike striking arts, Aikido does not primarily rely on kicking and punching nor does it seek to meet force with force. Often using evasion techniques, throws, and submission moves, the aim of Aikido is to neutralize conflict by using the opponent’s energy, movements, and intentions by way of matching, redirection, and blending. While it can be practiced as a stand alone art, it is also great as a supplementary martial art for those who also practice sport/sparring arts like BJJ, Judo, wrestling, Karate etc. Staying true to its core tenets of nonviolence, students learn through repetitive practice and positive reinforcement. Therefore, Aikido can be safely, and enjoyably, practiced by men, women and children of all ages. Globally, there are several schools of styles, including both competitive and non-competitive forms. However, the ultimate aim of Aikido training is not solely the acquisition of physical skills, (since it includes a study in force vectors, footwork, timing, and adaptive body mechanics), martial arts training is a vehicle to learn more universal principles. The process of Aikido training is really one of self-exploration, development, and transformation in order to respond appropriately and compassionately to the obstacles that we may encounter in life.